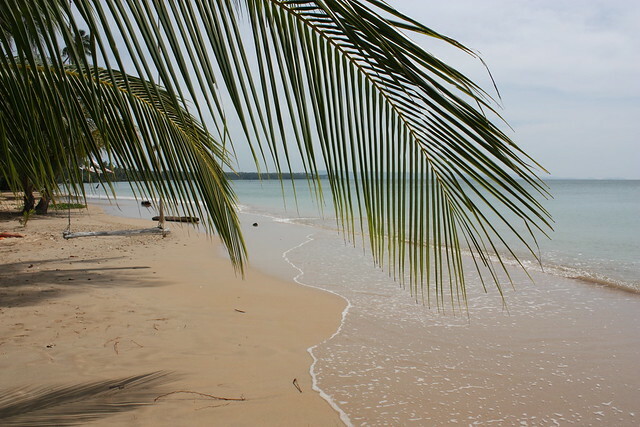 Not far from Ko Chang, is the beautifully scerene and peaceful island of Ko Maak, fringed with palm trees, surrounded by soft sand and crystal turquoise blue seas. The island is relatively undeveloped with only around 20 different places to stay, ranging from budget backpacker accommodation up to luxury resorts. A lot of the guide books hint at Ko Maak catering only for the pre-booked package tourists, this isn’t the case and most welcome walk in trade, however its probably well worth booking a head to avoid disappointment and trekking around looking for somewhere suitable to stay. Where Ko Maak really excels over other equally beautiful islands is its lack of development, accommodation is mailnly tasteful beach huts set subtly back from the beach. Covering the majority of the interior are coconut and rubber tree plantations that can be walked across quite easily to get from one side to the other. The main village has only a few shops, tourist agencies, bars and restaurants. If your looking for an action packed beach holiday then Ko Maak isn’t for you, the main activities to do sun yourself, swim in the beautiful ocean and walk along the lovely stretches of sand. Night life is pretty non existent and consists mainly of beach barbeques as the sunsets. We visited a few bars and there was very few people around with the exception of the Monkey Bar that seemed busy most nights. After a while the lack of people did leave us slightly longing for a bit more hustle and bustle and a little more atmosphere in the restaurants and bars. Getting to Ko Mak couldn’t have been easier, its relatively accessibility to Bangkok makes it a great island to visit along with Ko Kood on a shorter trip to Thailand. We took the simple trip from Ko Kood across to Ko Mak on the regular island Hopper ferry, dropping us off on the main beach Ao Kao. When we came to leave the island we had to extend our stay as the wind had picked up and the sea too choppy for the ferry to venture out. Woorth baring in mind when planning any itinery. From what we read Ao Kao beach was the place to be, the most beautiful of the beaches with the most selection of accommodation and closest to the little village. We ventured over to Ko Mak Rsort on the other side of the island to withdraw some cash and the beach was not nearly as nice. We decided to push the boat out a little for our stay on Ko Maak with Baan Koh Maak costing 1300 baht a night, we where lucky enough to get the end hut a stones throw from the beach. Our hut had a vibrant décor, polished concrete floors, large glass doors and air conditioning, it was well worth the spend! 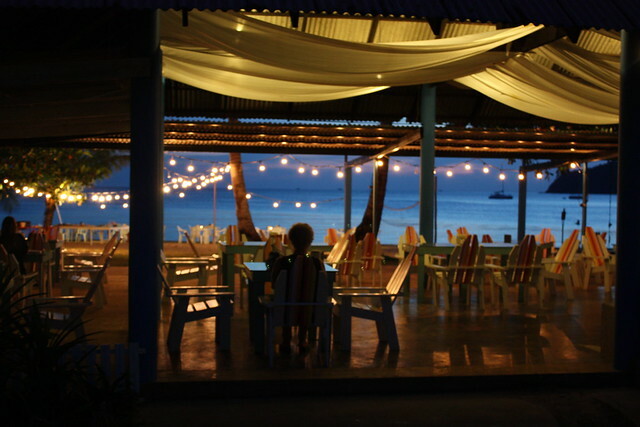 Another benefit of Baan Koh Maak was its Beach Cafe that served fantastic food and drinks as well as a great seafood barbeque, tables on the sand and fairy lights as the sunset. While it’s not as off the beaten path as it was years ago, it’s still one of the best islands in Thailand. I can’t believe Ive never heard of this place! Next time Im in Thailand Im there, although Im sure it will soon be the new place to go as Ko Chang has also changed so much in the last few years. Nice to read this blog. For many years I was in search of such beach destination which are less crowded and usher me close to Mother Nature. I need to book a vacation. I’m hooked. Matt (post above) says it is not as far off the beaten path as a few years ago. That appeals to me more. I prefer middle of the road, rather than way off the beaten path. Beautiful place! I think I may have my next place to travel to during vacation time!